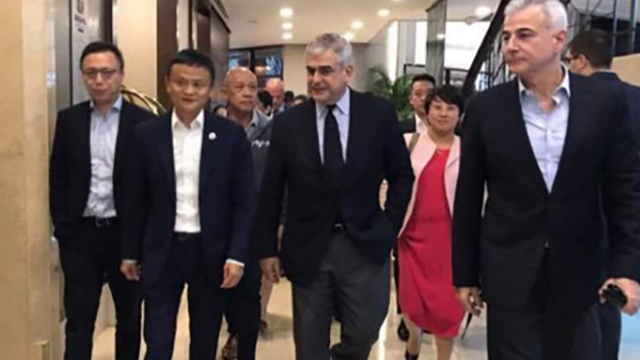 Jack Ma (second from left) walks with his Philippine partners Jaime Augusto Zobel de Ayala and Fernando Zobel de Ayala. Ma's Ant Financial has a stake in Mynt, Globe Telecom's fintech unit, its first investment in the Philippines. 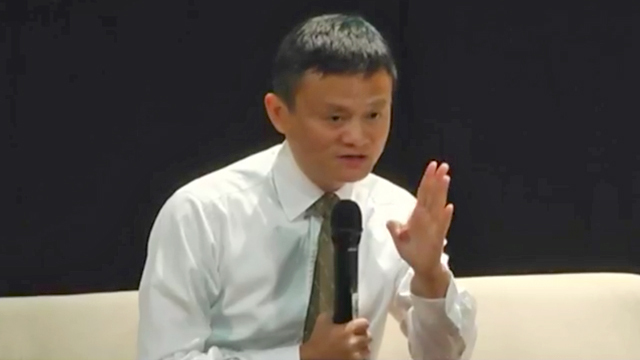 With more than 276,000 viewers who watched the Facebook Live streaming of Chinese billionaire Jack Ma’s remarks before De La Salle University (DSLU) students in Manila on October 24, there’s no doubt the Alibaba founder has a huge fan base among Filipinos. To be sure, Ma’s inspiring life story and his homespun business wisdom are part of the reasons why Filipinos find him easy to admire. He didn’t do particularly well in school and was rejected by Harvard University 10 times but that didn’t stop him from becoming the world’s 23rd richest man. His business precepts also resonate well with Filipinos, who are emotional and personalistic. When he says things like EQ is more important than IQ, a good boss is better than a good company or finding out the bad side or the cost of your dream, Filipinos could not help but agree. But beyond merely inspiring, Ma, in his talk on October 24, also laid out a bold vision of how Alibaba and its partners in the Philippines, notably leading e-commerce site Lazada and fintech pioneer Mynt, are moving to reshape the Philippines’ retail, trading and payments landscape. Lazada is leading the e-commerce revolution in the country. It gets an average 62.5 million page views a month compared to the next biggest online store, Zalora, which gets only 3.9 million monthly page views, according to price comparison site iPrice.com. Mynt, which is affiliated with Globe Telecom, has some three million users as of the end of 2016, about half that of PLDT’s PayMaya which has some six million users, according to BusinessWorldnewspaper. To be sure, it’s still early days for both e-commerce and fintech in the Philippines—total online sales are projected to reach only $1.2 billion or about just a percentage of total retail sales. Nonetheless, that has not stopped Ma from predicting that the Philippines has the potential to be a major fintech hub in the world because of high mobile phone use and the country’s fragmented geography. Ma is referring to the country’s wide adoption of smartphones. According to GCash’s data, there are now over 71 million mobile phone users and over 33 million smartphones in the country. Compare that to the 86 percent of Filipino households being considered “unbanked,” or lacking access to basic financial services. GCash’s new scan-to-pay system presents an easier, quicker and safer alternative to cash for transactions with retailers. Customers can simply scan a quick response (QR) code on the merchant’s stall and use their GCash wallet to pay for the product or service. The scan to pay system’s cashless nature is in line with Jack Ma’s assertion of turning the Philippines into a cashless society. Similarly, Ma also outlined his real long-term vision for his e-commerce ventures, including partnerships with Lazada in the Philippines: the disruption and redefinition of global trade itself. "The way we do trade will be different. It’s gonna be online. No made in China, no made in America, no made in Philippines. It’s made in Internet," he told DLSU students. That may sound strange for now but not when you consider that Alibaba is aiming to secure two billion customers worldwide in the next decade. Already Ma has unveiled plans during the G20 summit in China last year to build an electronic world trade platform (eWTP) that aims to set up a network of bilateral and regional agreements to bring down barriers, including tariffs, for e-commerce. The aim is to help SMEs sell and ship goods across countries with the least friction. Malaysia has embraced eWTP, being the first country to participate in the scheme outside China. Kuala Lumpur and Alibaba have established a public-private partnership in Malaysia’s digital free trade zone that aims to build a fulfillment center and cooperate on electronics payments and financing. The move opens the possibility for Malaysian SMEs to trade goods with counterparties in China and other parts of the world through Alibaba’s e-commerce platform with the mimimal tariffs or barriers. Alibaba’s efforts since the early 2000s to encourage poor households in remote villages to make and sell stuff through its Taobao e-commerce platform have turned out not only to be a big commercial success but also a big poverty reduction move. These have spurred the rise of more than a thousand so-called “Taobao villages”, or entire communities of hundreds of families that make and sell different items through the e-commerce platform, boosting income and creating employment. According to Business Insider, Taobao was the 12th most visited site on the Internet. The total value of all goods sold through the platform was $145 billion in 2013, almost double Amazon’s annual sales of $88 million.